The pdf forms attached here are intended to be used by homeowners who want to compile a record of their home. They may be used as a record that is kept with the house when it is sold, and they should be distributed to interested family members. The historical society likes to receive copies for our records. If you are willing to share your information, please contact Craig. The forms are not intended to be used for applying for state or federal historic status. That needs to be done through the appropriate agency. Click here for more information on state and national listing of historic sites. 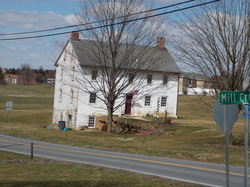 For general information on historic preservation in Pennsylvania, go to Preservation Pennsylvania.